Don't know if everyone feels the same but I really enjoy the changes taking place in Spring. It is a time for new in all aspects starting with buds, animal and bird life, babies, weddings going all the way through to thinking about decorating, washing pillows and cushions to changing colour schemes or adding a hint of a new colour to the old scheme. This year in the Chinese calendar is the year of the Monkey with red as the main colour. Other colours are Rose quartz which is a pink colour and Serenity which is a blue colour. These will all blend well in the soft furnishing range. Whether it is a complete refit or adding one or two new cushion covers. 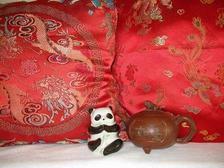 The rich red of Chinese fabric is a good example with the lovely embroidered designs. If red is not really your colour then there are a lot of patterns that just have a hint within the mix. This season brings thoughts of wedding plans and new additions to the family. These provide lots of ways to decorate and make things for these lovely events. A homemade gift can become a family heirloom or tradition with such special memories. The garden begins to wake up in the Spring and new colours arrive in the way of flowers such as crocuses and daffodils. These flowers can be found on some floral prints as a way to bring the not so warm outside inside to brighten up your room. As a way of bringing in new ideas then decorating a whole room with a new design or updating a tired look can be fun to do. Having a go at making something new and different such as curtains is a boost to moral. I have always wanted to try to make a Roman blind so may just have a go and as an after thought it could make another page. Enjoy whatever task you undertake this season. I seem to have been a bit lax in not having done any new pages since the last newsletter. However I have started a page on wedding day preparations and things that can be made to help with the cost of such an expensive day. To enlarge my knitting page I have also started a page of cable knitting and the different pattern that can be made using a third needle. I should like to finish all the pages I have started and hope to spend more time on this site. The saga of my kneeling cushion still goes on and again I haven't made another one yet but there is still time however maybe not ready for the new gardening season. Enjoy Springtime and all that brings, thank you for your support.